Have a passion project you really want to achieve? A website you want to build, or a small business you’d like to get off the ground? Are you an inquisitive go-getter and experimenter? Sounds like you want to be studying Web Design & Development! The Bachelor of Science degree in Web Design & Development prepares students for a career in the expanding web design industry. Develop the knowledge to create website content and graphics, improve performance and capacity, integrate web sites with other computer applications, and convert written, graphic, audio and video components to compatible web formats. Web Authoring courses focus on crafting web pages utilizing modern coding techniques to create mobile-ready, responsive web sites using semantically correct code. Students also learn how to leverage existing technologies and frameworks to build pages and sites quickly and easily, and to apply both client and server-side code to improve their user experience. Digital Marketing courses focus on researching and applying data toward creating campaigns that meet both user and business goals. They equip students with the primary concepts and skills necessary to manage social media communities and to design, develop, and deploy touch points to maximize conversions. Content Creation and Design courses build student skills in writing, image development, audio/video editing, and multimedia creation, as well as graphic design and layout skills, with an eye toward developing concrete visual hierarchies and effectively utilizing design patterns and trends. Is a Career in Web Design/Development Right for You? Find Out! Take the "Laurus College Digital Arts Career Training Readiness Quiz"
Web Authoring: Plan and build responsive web solutions using modern HTML and CSS techniques. Web Frameworks: Build and manage an eCommerce-based website that utilizes a modern back-end framework including plugins, themes, and custom code. Design: Develop skills toward creating eye-catching designs based on solid principles that communicate a specific message and drive engagement through call to action. Coding: Demonstrate an understanding of the foundations of programming through client-side and server-side scripting languages. Marketing: Measure, categorize, and compare data to create user personas and develop customer scenarios to build marketing plans, create landing pages, develop advertisements, and launch social media campaigns. Usability Design: Demonstrate an industry accepted pipeline for researching and developing websites based on usability principles while utilizing information architecture to organize content into logical groupings with appropriate navigation, and applying interaction design techniques to improve website usability and quality. Content Creation: Develop text, images, audio/video, and multimedia content consistent with brand goals to encourage customer engagement and conversions for use in digital marketing, desktop publishing, eLearning, websites, and other applications. Community Management: Demonstrate the management of online communities via creating a growth strategy to attract new users while developing relationships, creating community content, instigating discussions, and improving user experience. Social Media Management: Create profiles and develop content that is both consistent with the culture for each of the major social media networking platforms and matches the brand tone and personality. Branding: Plan and produce a brand identity and develop materials to support its tone and personality. Web Design professionals design, create, and modify web sites. This includes analyzing user needs to implement web site content, graphics, performance, and capacity, and may also involve integrating web sites with other computer applications. Web designers also convert written, graphic, audio, and video components to compatible web formats by using software designed to facilitate the creation of web and multimedia content. Plan, direct, or coordinate advertising policies and programs or produce collateral materials, such as posters, contests, coupons, or giveaways, to create extra interest in the purchase of a product or service for a department, an entire organization, or on an account basis. That means you’re in control of your learning experience. All you have to do is get the ball rolling. And pursuing training with Laurus for a career in web design, with all our dedicated support from Day 1 till you land that dream job, is a smart choice. 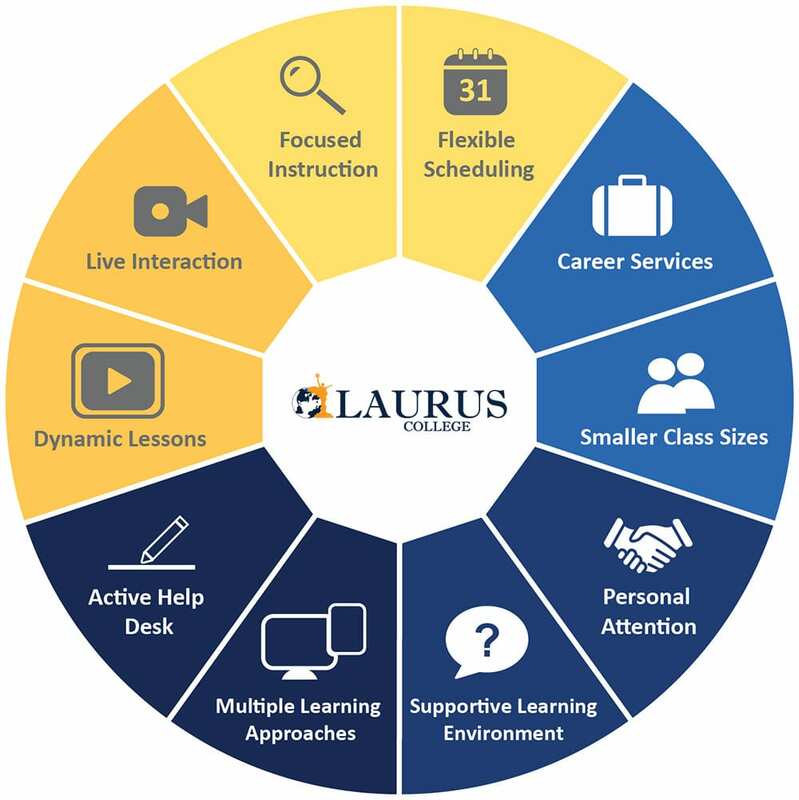 If you’re ready to make use of your creative skills and technical savvy to move up in life and create a brighter future with a rewarding career, Laurus College is your school. 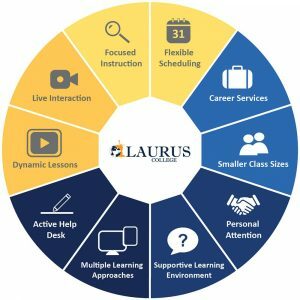 If you’d like to know more about the careers available to grads of our Information Web Design & Development program and explore whether Laurus is right for you, fill out the form on this page to receive more information. This course introduces students to Adobe Photoshop, the fundamental graphics application and image editing software used in the computer graphics industry. Students learn the fundamentals of this software, and will study topics including selections, layers, masking, filters, image manipulation and correction, composition, painting, and optimization for the web. Students examine techniques for efficient editing, processing, and file handling. Topics in photo editing may be studied, including color enhancement, lighting correction, and overall retouching. Vector graphics are ideal for simple or composite drawings that need to be device-independent, or do not need to achieve photo-realism. In this course, students learn how to use a computer software program to create and edit vector-based graphic images for use within a web page. Applying the principles of graphics design, students will create and edit images for use within a web page. Other topics may include drawing and various artistic techniques to produce visual graphics effective for the web. This course introduces students to the basics of design theory as it relates to web design. Students gain an understanding of the effective use of design elements such as points, lines, colors, shapes, & space to create examples that emulate current web design trends. Students are introduced to building common layouts using design elements to create intentional visual hierarchies using visual weight and basic design principles. Students work with wireframes to create custom prototypes of web pages and other design solutions and learn to incorporate peer critiques into their designs. Additional topics include art history, typography, color theory, and designing for different audiences. In this course, students gain an understanding of the basics of responsive design techniques. Students work towards creating responsive web pages using current techniques. In addition, students are introduced to common CSS frameworks to improve the speed and accuracy of building web solutions. Students work building pages utilizing common design patterns and elements through frameworks. Topics include media queries, percentage based widths, image DPI, and modifying previously learned patterns to be responsive to different screen sizes. In this course, students gain an understanding of the PHP scripting language. This server-side language is especially suited for web development and can be embedded into HTML documents. Students in this course will learn how to write programs to store and retrieve data, build arrays, work with control structures, and build contact forms. Students are introduced to sessions and cookies, custom functions, uploading files, and working with common programming elements. This course introduces students to the basics of relational database management systems for storage and retrieval of user data. Students will gain an understanding of Structured Query Language (SQL) and how to write SQL commands to perform basic Create, Retrieve, Update and Delete (CRUD) functions. Students will study these topics in a practical fashion through an examination ‘behind the scenes’ of popular content management systems. Students will use scripting and database knowledge to create custom themes, modify templates, and code simple plugins. This course introduces students to the basic principles of creating motion graphics for online projects. Students will learn to create engaging HTML5 and CSS3 based animation and interactive experiences for use on the web. This course teaches advanced techniques to create responsive animations for a variety of devices and platforms. Topics will include audio and video via native HTML code features, managing animation physics, and utilizing current scripting technology to generate the code with ease. This course teaches common traditional and modern marketing theories. It focuses on consumer behavior, sales management, and basic marketing principles and research. This course also examines marketing strategies for specific audiences. In addition, this course focuses on email marketing, growing an email list, and the in and out of managing email mailers. It also focuses on creation and management of pay per click ads and other types of online advertising as well as the creation, execution, and maintenance of an online ad campaign. This course explores designing digital solutions specifically for ease of use. Topics include mobile development, designing for efficiency, audience testing, and experience design. This course outlines the skills necessary for writing on the web. It explores both short and long form writing with an emphasis on tone, grammar, and writing for specific audiences. This course explores popular digital marketing channels. Topics include social media use, trends, audience, and advertising. It also teaches audience communication and mood/tone management, dealing with angry customers, creating and continuing online conversations, and other forms of community management. This class also focuses on determining audiences for specific channels. This course focuses specifically on creating layouts for different online channels. How to create items for Facebook vs Twitter and how to set up websites specifically for sharing. It also goes over creating landing pages and managing brands across different channels. This course introduces students to analytics and its role in digital marketing. Students will learn how to gather and interpret customer metrics and use them to plan and develop online advertising campaigns through popular web platforms such as Google AdSense. The course will teach students how to set client budgets and achieve individual client goals by interpreting and applying data trends. Students will also learn how to integrate tracking pixels, plugins, and other metric gathering tools into their web solutions. This course assists students in creating portfolios, developing resumes, and improving interview skills. It explores different career options for digital marketers including freelance web design.